"...I was born in Tamaqua on 21 April 1894. My mother's maiden name was Annie Spiese and her father's name was Henry Spiese. With Henry Spiese and Henry Aurand as grandparents, it was inevitable that I would be named for both, Henry Spiese Aurand. We lived in the Pines, above the railroad station, until I was a little over a year old, and then on Pine Street, across the street from the Redding round house. In 1902, we moved to the corner of Lehigh and Lafayette Streets, one block from your grandfather's home. In 1904 we moved to Shamokin, Pa., and in 1911 I entered West Point. Until that day, like my two grandfathers, I was called Harry and my last name was pronounced Aur'- and. 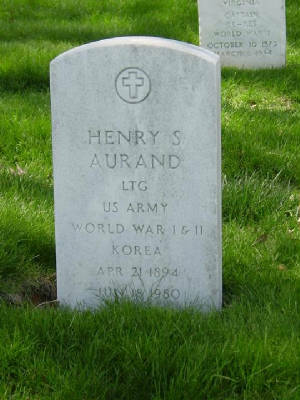 But the upper classmen at West Point changed this to Henry Au - rand', which has stuck with me ever since. And with my sons also." He served in the Army from his graduation from West Point in 1915 until 1952. During his time in the armed services, Aurand gained large amount of logistical expertise. That is, he became good at planning how to move, supply and quarter troops. He attended the Army Ordnance School, the Command and Staff College, the Army War college and the Army Industrial College. As a result of his expertise, Aurand took a leading role in the effort to outfit the Allies with weapons through the Lend-Lease program, before the United States became fully invested in the war. 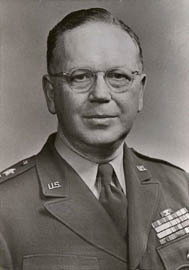 During the World War II, Aurand became the Commanding General for Normandy Base Section, planning supply missions to the armed forces during the Battle of the Bulge. Succeeding the war, Aurand became Commanding General in the China Theater and Commanding General in the Africa-Middle East Theater, overseeing retrograde movements, or movement of United States troops back home. 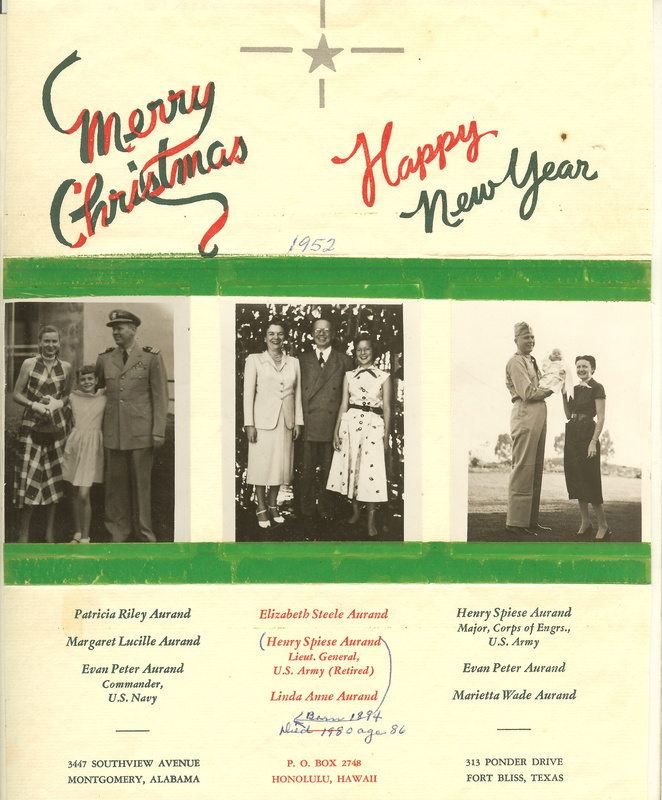 Aurand commanded the army in the Pacific from April 1949 to 1952, when he retired. He earned many decorations, according to the Arlington Cemetery website, including the Distinguished Service Medal, the Bronze Star Medal, the Mexican Service Medal, the World War I Victory Medal, the American Defense Medal, the American Campaign Medal, the Asian-Pacific Campaign Medal, the European-African-Middle Eastern Medal, and the World War II Victory Medal. Henry Spiese Aurand died in 1980, at the age of 86. To see the full image, right-click on the image, and click "Open Image in New Tab"
"Henry S. Aurand, Lieutenant General, United States Army." 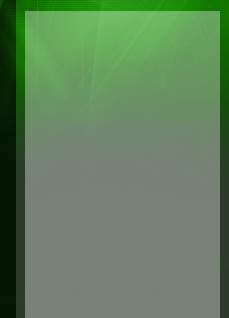 Arlington National Cemetery Website Title Page. Web. 28 May 2010. <http://www.arlingtoncemetery.net/hsaurand.htm>. Photos and excerpt courtesy William F. Aurand Jr.